Born October 27, 1933, in the community of Rio Grande, Alberta, to Roland and Ida Letendre. He was one of 11 siblings. Passed away November 18, 2018 in Calgary, Alberta. We knew him as father, grandfather, great-grandfather, husband, brother, cowboy, volunteer and friend. Clarence was special to all who knew him in some way. He was a hard worker who inspired those around him to do their best. We are blessed to have known him and we are going to miss him very much. When he was young, he took a job to help support his family during difficult financial times. Then he met and married the love of his life, Emma (Amy) Knott on October 22, 1956, and they had 9 children, one of which only lived a few days. He moved to Fort. St. John, B.C., in the early 1960s and that’s where he raised his family. Clarence ended up working in the oilfield to support his family. He worked his entire career in the oil patch until he retired. Clarence was a natural athlete and he loved watching and participating in rodeos. His joy was team roping and he ended up winning many ‘trophies’ whether it was cash prizes, belt buckles or saddles, and he was tickled pink when he won something. He loved the cowboy way and he was always ready to lend a hand to whomever needed one. Clarence was very proud of his children and he enjoyed being a part of all their accomplishments and of telling people about them. He loved country music and dancing, and he and mom swung around the dance floor whenever they could. 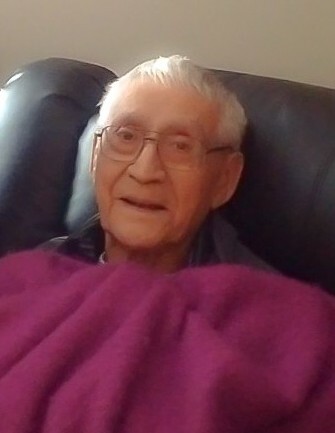 He loved a good joke, hunting, eating Amy’s home-made bread and bannock, watching his ‘Jays’, and having coffee with his friends. Clarence was predeceased in death by his loving wife, Amy, and by most of his siblings. Clarence leaves behind his children: Karen, Donna, Roland, Cindy, Kathleen, Patricia, Clarence and Darcy along with numerous grand-children, great-grandchildren, nieces & nephews. He lived his life living the life he enjoyed, with many good friends, rodeos and music. Though sadly he is gone we want to say, “Dad, you can finally take your boots off, put your feet up and rest.” Your journey here on earth is done. In lieu of flowers, donations can be made to the North Peace Light Horse Association, FSJ. Phone number: 250-787-7153; 6929 Equestrian Rd, Fort. St. John, BC, V1J-0B4.